The bag to hold just about everything! Perfect as an everyday tote or craft carryall. Big enough to pack for a weekend getaway and great on the beach! Lots of pockets inside to hold and organize it all. Finish it with a zipper or without. 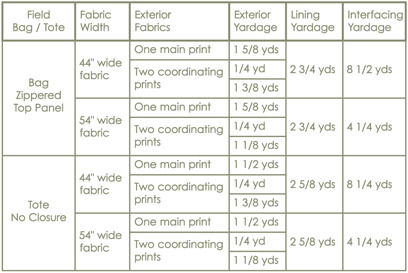 Materials List: Allow extra yardage to match or center a design on your fabric. The yardage amount listed is enough for a one-way design. 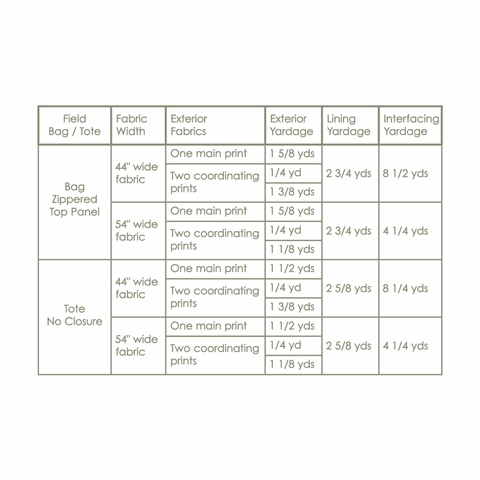 The Field Bag comes in two styles. "The Bag" has a Top Panel with a zipper and "The Tote" has an open top without a closure. There are 2 options to make the Exterior. The first uses one print; the second uses 2 coordinating prints. Either style can be made using 44" wide light to mid-weight fabric OR 54" wide mid-weight Home Dec fabric.